A slew of federal agencies for the first time since 2015 have updated their shutdown contingency plans, noting who would continue to work and who would get sent home in the event Congress fails to reach a budget deal just before Christmas. Before President Trump on Dec. 8 signed a stopgap measure to stave off a shutdown for two additional weeks, White House officials warned agencies during a phone call led by the Office of Management and Budget they should begin preparing for a lapse in appropriations. Lawmakers now have through Dec. 22 to pass a measure to keep agencies open. Another OMB-led phone call will likely take place before the new deadline. An update to OMB guidance during the Obama administration required agencies to refresh their shutdown plans at least every two years starting in 2015. 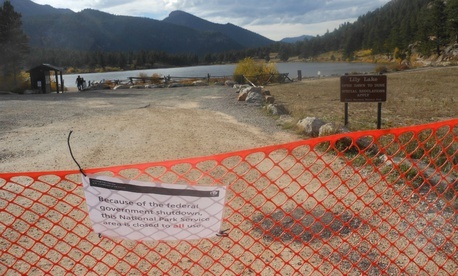 Nearly all agencies updated their documents spelling out who would or would not be furloughed in September of that year, but—until recently—agencies had not updated their plans this year. As of Monday, 56 agencies submitted their updated shutdown guidance to OMB detailing who they would furlough under a 2017 appropriations lapse. Some agencies would experience a shutdown in vastly different ways among their components. At the Commerce Department, the Census Bureau would furlough 99.9 percent of its workers, while the National Oceanic and Atmospheric Administration would have more than half of its employees working. Agency overseers would also have varying roles. The Interior Department would furlough its entire inspector general’s office, while the Treasury Department would retain 15 percent of its watchdog employees. Most agencies’ guidance differed little from their 2015 plans. The Federal Communications Commission would see the biggest jump, furloughing nearly 6 percent fewer employees this year. The Small Business Administration would send home an additional 3 percent of its workforce without pay. Some agencies, such as the State Department, have updated their plans but have not spelled out exactly who would be furloughed. During the 16-day shutdown in 2013, State sent home just a few hundred of its 70,000 employees, but warned it would have had to add thousands to that list if the government had remained closed much longer. 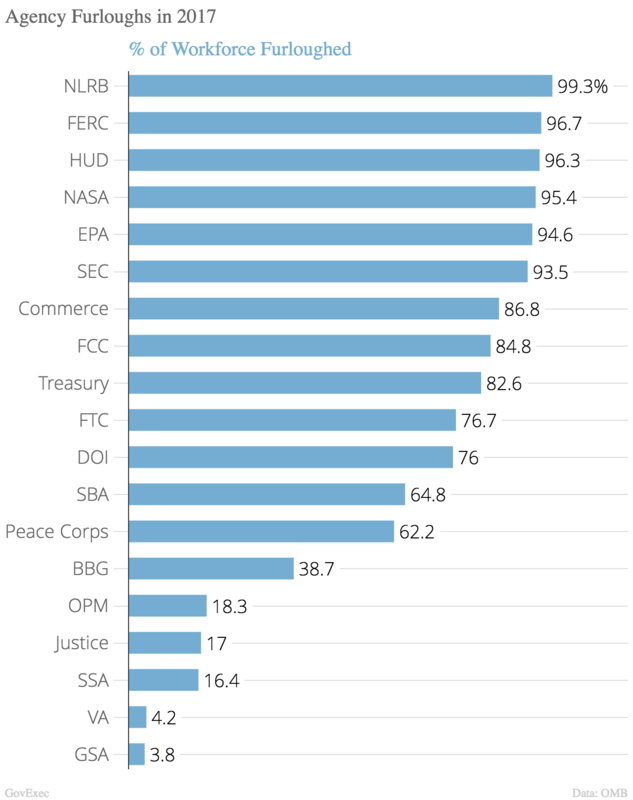 Below is a chart detailing the furlough rates of every agency with more than 1,000 employees that has so far submitted updated shutdown plans. This story will be updated as more plans come in. It is still unclear what the total furlough rate would be if the government were to shut down this year. All told, the Obama administration planned to furlough about 860,000 federal employees in 2015, or about 40 percent of the workforce. An OMB spokesman previously declined to comment on whether the Trump administration has pushed for the updated agency plans required by the guidance, saying only that it would post the plans as it receives them.